Gone are days when we used to watch TV channels at our home on a television screen. Now TV channels are relayed over the internet, and we can watch them live streaming on official and third party websites. Movies, IPL cricket matches, World cup, ESPN and many other TV programs are telecasted in this way. Some developers included these web links in their mobile applications, and they released apps that could be used to view internet TV on mobile phones. With the introduction of 3G and other high speed technologies the mobile TV industry is booming at a faster rate never than before. 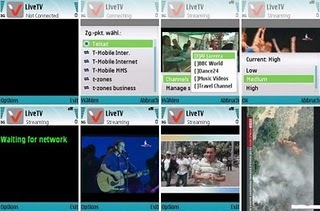 Mobile internet TV applications mainly support iOS (iPhone, iPod Touch, iPad), Android, Nokia-Symbian and Java handsets. 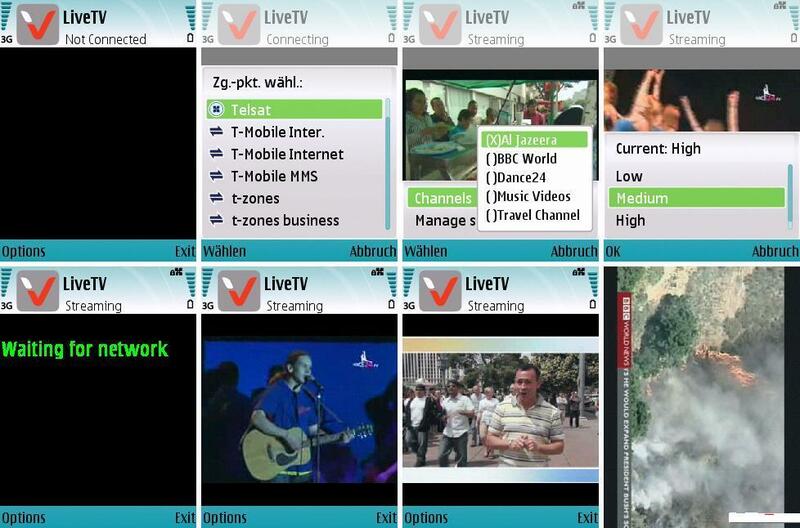 Given below is a mobile internet TV application for Nokia handsets. This is a freeware mobile TV application. It has 5 channels in the list; Al Jazeera, BBC World, Dance24, Music Videos and Travel Channel. After download you have to activate the service by sending an international SMS. The application will send this automatically so you have wait for some time before it completes the process. Download mobile internet TV here. (Nokia-Symbian). Another good multi-platform mobile TV application is the SPB TV developed by SPB software. It comes with around 140 channels and supports Windows Mobile, Symbian, Bada, Android, BlackBerry, HP Palm web OS, Maemo and Symbian operating systems. You can download it free here. If you are looking for a reliable Mobile TV application, which support your local channels, here is the one for you. TUV player is not free, but I can guarantee you that it will include at least one channel in your local language. The TUV iOS app lists around 1000 channels in different categories. It may take some time to load the streaming after selecting a TV channel. Wait for a few minutes it will start playing it without any issues. You can download TUV mobile TV from iTunes store or Android market. The main issue with mobile internet TV streaming is the data charges. It consumes a lot of 3G/2G bandwidth. So it is always better to use an unlimited plan with such applications. but how 2 send sms? ?nd 2 whereE??? file is not downloadable or link is broken. i need the it . i want a mobile tv for my samsung sgh e840 mobile. I want mobile tv 4 nokia 7210. Hw 2 download mobile tv 4 Nokia 7210. Plz help me in activating mobile tv on my nokia 3110. Now select a connection that Mobile TV could access . Select a TV channel and select the playback quality . Mobile TV will now buffer the selected TV channel and start playing . What connection will i used?what access point,does it have any settings.plz help me 2 activate it.tanx mur power! can not connect, network time out:-33. What can I do? How can i open this internet tv.any one give adivce.please.my mobile e65. How to open this tv interent.in this mobile did not show any channels. This connecet say time out.33 .what is this tell me any one. i guess mobile tv apps like mundu.tv or yupp.tv are much better off…mundu.tv doesnt even require registration…just dwnload and works…. i downloaded this file (live tv) but upon opening a message says ”cannot open, this user has run out of bandwidth….” wat could the problem be?? I have downloaded the live tv application,g but Iwas unable to the sms activation please send me the activation sms. I have download application Live TV but working what’s problem. I have downloaded the Live TV application on my Nokia E 65, but it doesn’t connect with a message -time out-33-. Would somebody help me finding the correct course of connection and sending SMS to whom. where send sms for activation mobile internet tv?plz me notify by email.Thankyou. I want to download mundu tv in my mobile (spice qt66) but it didn’t download and I tried it again and again please help me. I want to download mobile internet tv for spice qt66, please send me link. I want to mobile TV on my Nokia 5233. pl. help me.